The marches continue the collective resistance that has galvanized Spanish civil society since the 15-M occupation of the Puerta del Sol, but which is rooted in a long tradition and practice of autonomous politics of resistance and civil disobedience in Madrid and around Spain over the past decades. 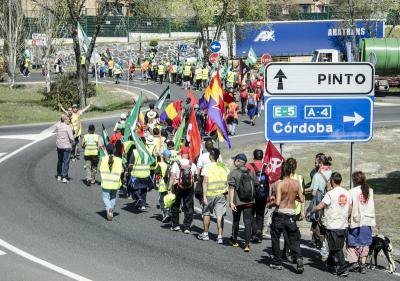 On March 22, many tens of thousands of people arrived in Madrid from all over Spain in the six columns that formed part of the Marches of Dignity. Dozens of civil associations and social movement groups across Spain have been organizing these marches for months. The first column left Santiago de Compostela on February 20, and the last departed from Mérida on March 10, all six flowing into Madrid’s central streets. In 2014 we find ourselves in an extremely difficult situation ...one of social emergency...Millions of workers unemployed...Hundreds of thousands of families have lost their homes, worsening salaries and labour conditions...Our youth cannot construct a life project with dignity and are forced into emigration like our parents and grandparents...We say no to this patriarchal system that throws us back to the distant past and denies us rights over our own bodies...We are suffering from the policies carried out by the Popular Party at the dictates of the Troika... which consist of robbing us of our rights and impoverishing the majority. Policies based on the payment of an illegitimate debt that we citizens did not contract and which is the product of bankers’ speculation and the excesses of our different governments...They are taking advantage of the crisis to strip us of our rights. These cutbacks are causing suffering, poverty, hunger and even death, and all so that the banks and economic powers can continue to generate huge profits at the cost of our lives...For these reasons we call for the streets of Madrid...to be filled with dignity and rebellion on March 22... BREAD, WORK AND HOUSING. TO THE STREETS. IT IS TIME. In addition to the columns of people who have been marching towards Madrid for the past few weeks, buses arrived from ten of Spain’s autonomous communities. They were met in Atocha station by local social movement activists who have been meeting in autonomous assemblies throughout the city, primarily in the many squatted social centres, to provide support, local coordination and accommodation for the marchers through a solidarity accommodation scheme called Campamento Amigo 15-M, as well as planning their own participation in the marches from their different assemblies. 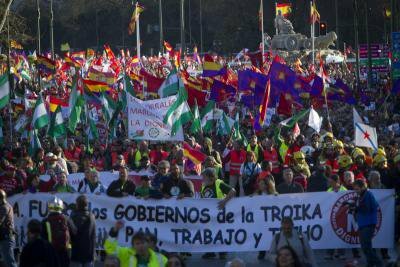 The marches have brought together the main actors in Spain’s sustained collective resistance to austerity measures and against what many Spaniards perceive to be a discredited government and democracy. Rajoy’s Popular Party government has been embroiled in high profile corruption scandals involving illegal payments to party leaders running to millions of Euros over the past 11 years, and documented in the party’s former financial managers’ alternative book-keeping (now submitted as evidence in his own trial). At the same time, the government has been pursuing a relentless attack on public services and programmes, including attempts to privatize public services such as health care. It has failed to mitigate the devastating housing crisis facing hundreds of thousands of Spaniards who are losing their homes, due to an inability to pay their mortgages, or to address the serious unemployment crisis, especially acute among youth, where it is at about 50%. Under Spain’s existing mortgage laws, the vast majority of mortgages that default are not satisfied by the defaulter surrendering the property. Rather, he or she is still liable for the outstanding portion of the debt. In a context where housing prices have plummeted since the bursting of the housing bubble, this means that not only are families losing their homes, mostly due to unemployment, but they continue to be crippled by debt burdens of tens of thousands of euros, with little chance of ever paying them off or acquiring a new home. Homelessness- and eviction-related suicides are on the rise, the latter termed “austericides” by housing activists. As social unrest continues, with as many as three protests a day in Madrid’s Puerta del Sol, the Popular Party government responds with laws designed to crimialize protest and initiatives to limit the space available for citizens to exercise their democratic right to dissent. As the platform “We Are Not Crimes” (No Somos Delito) explains, the proposed Law of Citizen Security, also known as the “Anti 15-M law” (part of the proposed reform of the penal code) would introduce profoundly disturbing articles pertaining to protest. Anyone who disseminates a call to protest (for example, by sharing a link on Facebook) at which some public disturbance occurs, would be liable for a charge of disturbing the public order, even if they did not attend the protest. Passive resistance at a protest would be characterized as an attempt against authority; private security guards would be offered the same legal protections as police officers, and disturbing the public order charges could be extended to acts in private spaces (such as bank offices, where many occupations have taken place against bank fraud and malpractice and to protest abusive mortgage clauses). If disturbances to the public order take place during a protest, this is considered an aggravating circumstance. The organizations to which an individual belongs would be liable for any act of public disorder, extending the legal limitation of public disturbance from the individual to an organization, a fundamental shift in the law. The proposed law has been contested not only by activists but by the Spanish Socialist Workers Party (PSOE), United Left Federation (Izquierda Unida) and the Union, Progress and Democracy Party (UP y D), as unconstitutional, unnecessary and a threat to civil liberties. Meanwhile, the Government of Madrid (Popular Party) has petitioned the Ministry of the Interior to transfer all protests to be moved outside the city centre, alleging the disruption they cause to businesses, tourists and citizens. The current government’s desire to criminalize protest instead of responding to citizens’ concerns epitomizes 15-M activists’ counterargument to the “anti-political” label often used to characterize them: “We are not anti-politics, politics is anti-us”. The high level of coordination of the Marches of Dignity, which follow mass protests against abortion reforms and social cuts and privatization, belie characterizations of the 15-M movement as being “over”. The Marches of Dignity represent some of the key issues around which Spaniards have been mobilizing in the context of austerity, with high levels of public support. Youth, LGBTQ activists, feminists, pensioners, environmentalists, civil rights and liberty defenders, immigrant platforms, precarious workers, housing activists, the many citizen tides working to halt cuts to government spending and to fight the privatization of public services, unions and many more will be joining the protests, which are also supported by the federation of parties “United Left” (IU). The marches represent a continuation of the collective resistance that has galvanized Spanish civil society since the 15-M occupation of the Puerta del Sol, but which has its roots in a long tradition and practice of autonomous politics of resistance and civil disobedience in Madrid and around Spain over the past decades. Although as the party with the absolute majority behind legislative initiatives and policies, the Popular Party is a key target of these protests, autonomous protesters make clear in their manifesto that they are not partisan, but against all governments and parties that support cuts to rights and services. These social movements have renewed and redefined the notion of good governance, which involves more than inclusion in an electoral system, or the provision of basic state services, such as education. The notion of democracy and citizenship is being extended and deepened, enriched by the participatory processes developed in the heart of social movements and collective actions of resistance and resilience. Today, the renewed conception of citizenship demands governance that is not only transparent and fair, but that seeks to provide fundamental welfare for citizens, and promote and defend citizen rights to basic needs such as food, housing, and health care, and essential democratic rights, including the right to protest.